As those in and Packerland celebrate the team’s 13th championship in NFL history, the mind travels back to when Green Bay was the desolate outpost that few players wanted to go to. The team had a celebrated past yet the years after Vince Lombardi’s team won Super Bowl II were lean with very few postseason appearances. Everyone points to the hiring of GM Ron Wolf or Mike Holmgren, or Reggie White’s free agent signing in 1993, or even Brett Favre being picked up in 1992 as the first step in the team returning to prominence. Each were significant but weren’t the first step. That distinction belongs to former All Pro receiver Sterling Sharpe who became the preeminent receiver of his time and was outplaying the legendary Jerry Rice at the time of his forced retirement because of a neck injury. 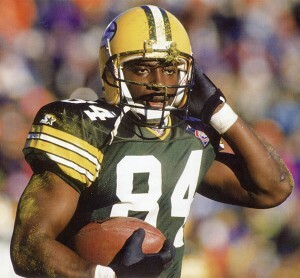 The Packers selected Sharpe in the ’88 NFL Draft and he played for 7 seasons. During that time he would go on to produce….nope not going to tell the story in that fashion. This was Terrell Owens before Terrell Owens meaning he would run over cornerbacks who tried to jam him or tackle him on slants. I can still see the touchdown in ’92 when he drug CB Darryl Henley and half the LA Rams secondary into the endzone from the 5 yard line, knocking out Safety Pat Terrell in the process. In an era where receivers were sleek, run and shoot quick guys like Earnest Givins, Drew Hill, & Andre Rison as the preferred types. Michael Irvin and Sterling Sharpe were breaking in a new mold later carried on by Detroit’s Herman Moore and Minnesota’s Cris Carter. The muscular intermediate receiver who were physical with cornerbacks then would slip by them for 40 yard gains later in the game once they beat up on them a bit. Sterling started rather slow with a 55 catch rookie season where he only scored 1 touchdown and vowed to improve his approach to the game. He felt the media was harsh in how they treated him and nearly went the rest of his career without granting an interview…well almost. In 1989 he burst onto the national scene with 90 receptions for 1,423 yards and 12 TDs, earning the first of his 5 Pro Bowl and All Pro appearances. He teamed with Don Majkowski to power The Pack to a stellar record of 10-6 which included a late season win over the World Champion 49ers in Candlestick. He became the focal point of Head Coach Lindy Infante’s offense and gave the Packers a legitimate star to help attract Plan B free agents. Sharpe went on to Pro Bowl and All Pro status in the 1990, 1992-1994 seasons. The greatness of this talent was showcased in 1992, he had to learn a new offense from a new coach in Mike Holmgren and during the third game learn to play with first time starter Brett Favre. How did he perform? Well he went on to break Art Monk’s all time NFL record of 106 catches in a season, going for 108. He totaled a career high 1,461 yards and scored another 13 TDs. Sharpe led the NFL in receptions, yards, and touchdowns in 1992 which is amazing considering the coach & quarterback scenario. Think about it for a sec… Jerry Rice’s most prolific years were 1987 and 1995 where he totaled 22 TDs receiving (87) and 122 catches / 1,808 yards gained in 1995. These were achieved with league MVPs & Super Bowl MVPs Joe Montana and Steve Young in their 8th and 5th seasons as starters respectively. So naturally he would get better in the ensuing years with a new system in place right? In 1993, his second year in Holmgren’s system, he broke his previous All Time NFL record of 108 catches going for 112 rec., 1,274 yard and 11TDs. He also introduced the sporting world to “turf toe” as an injury to the sporting world lexicon which was a dislocated large toe basically. The painful injury not only kept him from practicing ALL YEAR, he had to wear a shoe 1 1/2 sizes larger on the foot with the injury. What would he have done had he been able to hone his pass routes in practice? The Packers went 9-7 and made the playoffs as a wild card. They played their division rival Detroit Lions in the Silverdome and Sharpe electrified with a 5 rec., 101 yd 3TD performance. 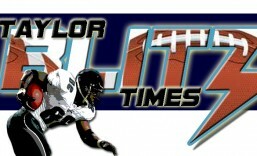 His 3TD receptions tied the NFL All-Time Post season record which still stands. 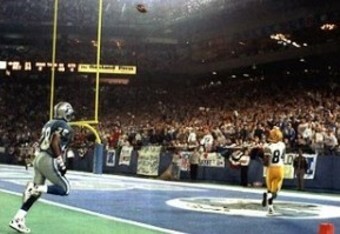 The last of which (pictured above) was a 40 yard TD from Favre with less than a minute to play. Not bad for his first playoff game huh? It was a day so interesting and exciting that he broke his 5 year boycott of granting interviews and spoke at the post game press conference. The next week the Packers lost to the world champion Dallas Cowboys 27-17 yet Sharpe caught 6 passes for 128 yards and 1 TD. He showed he was a prime time performer even in the postseason. He had led the league in receptions in back to back years and was still improving with a young up and coming quarterback. What more could the future hold? Yet 1994 proved to be the last season in the NFL for Sterling Sharpe. A promising career cut short with a serious neck injury that robbed us of viewing the best receiver in the league at the time. Really? Yes really! Sharpe went out with a bang. In ’94 he amassed 94 rec. for 1,119 yards and an astounding 18 touchdowns. The 18 receiving TDs were the second most in NFL history (at that time) tying the old all time record with Mark Clayton (who did it in ’84) and who ironically was Sharpe’s teammate in ’93. Along the way there was a much ballyhooed showdown on Thanksgiving in Dallas to show the nation Sharpe and the Packers had arrived. They lost 42-31, but again Sharpe dazzled the nation with a 9 rec. 122 yards and 4 TDs on the league’s #1 defense, totally outperforming counterpart Michael Irvin. Both players, along with Andre Rison, battled Jerry Rice in the stat sheets for league supremacy at receiver in the early 90’s. However Sharpe missed the playoff rematch and retired after the season. 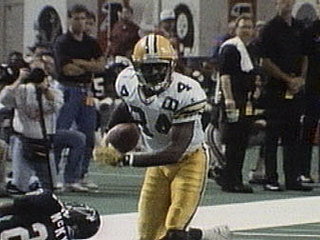 Sterling Sharpe left the game after 7 super productive seasons with 595 rec. for 8,134 yards and 65 TDs which doesn’t truly paint the full picture. In his last 3 years he caught 314 passes for 3,854 yards and 42 TDs averaging 104 receptions per season. At that rate over 3 more seasons he would have crossed 900 catches for almost 12,000 yards and 107 TDs which he easily would have done. How do we know this? Brett Favre’s next three years in ’95,’96, and ’97, not only was he league MVP all 3 years, he threw for 38, 39 and 35TDs in those seasons. Those three seasons the Packers lost the NFC Championshp Game in ’95 yet made the Super Bowl the next two years. It’s a shame that the team he led back to NFL prominence would go on to be league champion without him. Ironically his brother Shannon gave him his first Super Bowl ring when the Broncos defeated the Packers in Super Bowl XXXII, citing Sterling as his greatest male influence. How do you gauge impact? Well you need to ask yourself a few questions. In 1992 Mike Holmgren was the hottest coaching commodity when the Vikings, Steelers, and Packers were vying for his services. Seeing that Holmgren wanted to install his “west coast offense”, don’t you think Green Bay won out by having Sterling Sharpe as his Jerry Rice already in tow to play his “Z” receiver? What happens if the star receiver wasn’t on hand to aid a nervous young Brett Favre, allowing him to gain confidence? If he would have struggled, Don Majkowski gets his job back 7 weeks later and we may never have known of Brett… think about it. Favre only became the NFL’s all time quarterback in ….well everything. In fact it was Sharpe who got Favre rolling in his first start against Pittsburgh absolutely scorching Rod Woodson on a stutter-go 76 yard touchdown to settle Favre down. 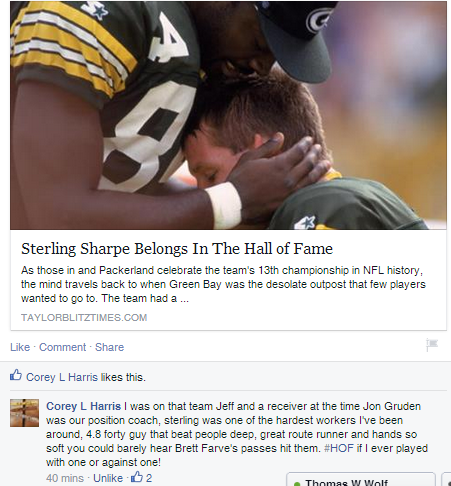 Without Sterling Sharpe, NFL history and certainly Green Bay Packers history would have been altered drastically. This was a talent that blocked in the running game and didn’t dance in the endzone when he did score. He didn’t jump up signaling first down when he made a catch. He was the absolute antithesis of the “me” receiver that has overtaken the league over the last 20 years. After Charlie Hennigan in 1961 ( 101 rec. /AFL’s Houston Oilers), Art Monk in ’84 (106 rec. / Washington Redskins), and ’90 Jerry Rice (100 rec. / San Fran 49ers) it was Sharpe who made the 100 catch season a staple in league totals, going for 108 receptions then 112 the following year. The fact that he didn’t self promote on every television camera he saw yet isn’t in the Hall of Fame, may give way to why we see receivers that do. Gale Sayers isn’t the only great player to have his career cut short by injury so Sharpe needs to be more than considered. His play and on field conduct was a celebration of how and why football is played and loved by millions. For induction into the Pro Football Hall of Fame, I present to you Sterling Sharpe. This entry was posted in Players Who Should Be In the Hall of Fame and tagged Brett Favre, football, Green Bay Packers, Mike Holmgren, NFL History, Pro Football Hall of Fame, Sterling Sharpe, Sterling Sharpe Hall of Fame. Bookmark the permalink. ← Is Mike Shanahan Overrated?? Sad to see his career cut short by the neck injury. Thanks for writing this Jeff – so true. My all-time favorite player, dating back to his days as a Gamecock. A lock for the HOF if not for his career being cut short. He was a true gamer.. a one man recking crew… would have been top 3 alltime greatest if could have stayed healthy. Extemely fun to watch! So true!1 Great player, teammate and man!